Type SOOW Flexible Cords are designed for extra hard usage on industrial equipment, heavy tools, battery chargers, portable lights, welding leads, marine dockside power, power extensions, and mining applications. SOOW Flexible Cords are also UL® and c(UL)® listed for water resistance. Heat-, moisture-, and oil-resistant EPDM rubber. 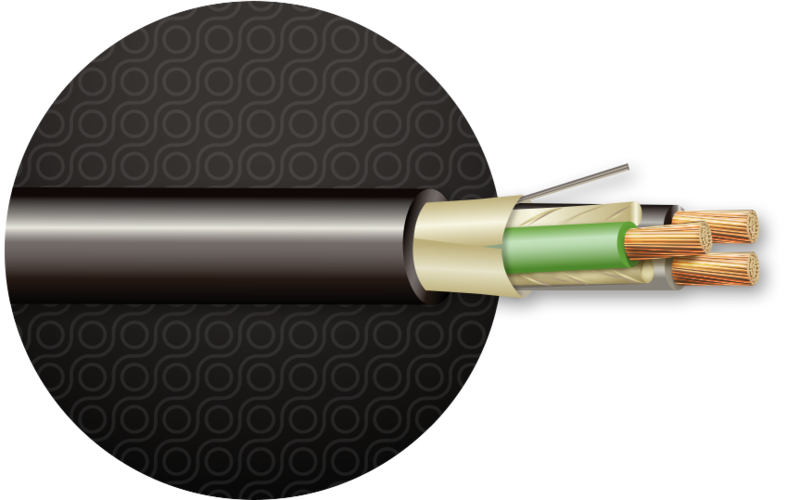 Insulated conductors are cabled with fillers. Black heat-, moisture-, and oil-resistant flexible CPE extruded over the entire assembly. A wrapping beneath the jacket facilitates easy removal. Bare flexible stranded copper conductors are insulated with heat-, moisture- and oil-resistant EDPM rubber and then cabled with fillers. Next, separator is wrapped around the assembly for easy jacket removal. Finally, a black heat-, moisture- and oil-resistant CPE jacket is extruded over the entire assembly.